I am just back from a tennis weekend in Hampshire but before that – on Friday – I did 2 hours of archery, which was a BAD idea (birthday present voucher for ‘him indoors’ which was just about to run out!). Thanks for all your comments on the shortlisted stories, by the way. It only goes to show that we’re all different and another judge would almost certainly have chosen 2 different winners. For my part, I thought any one of the 6 could have been placed first or second and it was a very difficult decision! But, for sheer cleverness and original use of the words- and for the fact that it made the judge (my friend, Chris) laugh and keep returning to this story again and again.. the runner-up is ‘Paradise Mislaid’. Well done, Philippa! And the winner – because of the understated beauty of the writing, the clever and surprising ending and the fact that it makes you think, again and again, about the narrator and this intriguing relationship – is ‘Cowboys And Indians’. Well done, Linda! I’ll be contacting the winners directly about their prizes but well done to the other 4 shortlisted authors. You were, believe me, only just pipped to the post and I hope you’ll be inspired and encouraged by your shortlist success – because it is, very much, a success. On a different note – and because I like to give you a little something ‘extra’ on a Sunday evening – there’s a novel-writing competition just launched on the Mumsnet website, which may be of interest. You’ve got until 30th January 2015 to submit the first 8,000 words of your novel by email, along with a 500-word outline of the remaining chapters. So, what are you waiting for…?! This entry was posted in Competitions, Short Stories, Successes and tagged winners. Bookmark the permalink. 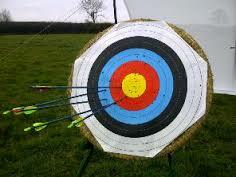 10 Responses to Who Hit The Bullseye…? The competition was such fun – thank you for running it. And well done Linda and Philippa – worthy winners! Congratulations, Philippa and Linda. These comps are aways fun to do. Looking forward to the next one. Also congratulations, Helen. I see you’ve a story in The Weekly News this week. Ah, close but no cigar. Congratulations, Philippa and Linda. Congratulations to Linda and Philippa – and to the runners up. Thanks so much! I nearly didn’t enter this competition because my first draft of the story was well over the word limit. After cutting it – and cutting it – to get it under 100 words I wasn’t sure if it would make sense to anyone else! Thanks, I’m delighted!! The first piece I wrote was too long and lost all meaning/interest when I tried to cut, so I chucked it out and wrote the second one – I think it’s the first time I’ve written something that made someone laugh! Thanks again Helen for running your lovely comp. And congrats on The Weekly News story! Glad you found it useful, Carol! That’s always nice to know.